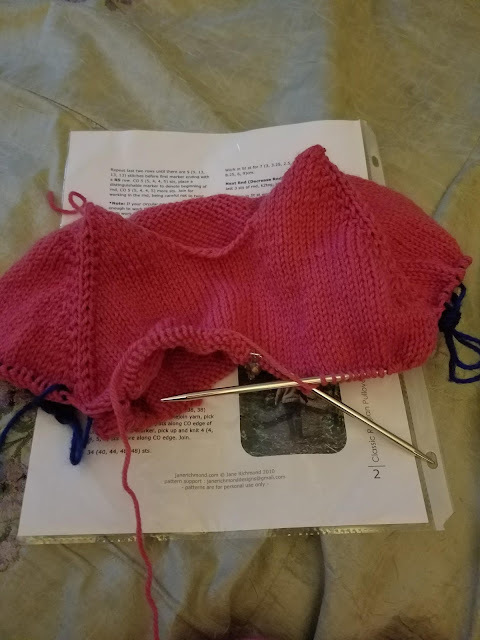 I am hoping to get this sweater done in a couple of weeks. I have lots going on, and many projects to complete before cold weather sets in. I am lucky that this is a child's sweater, which means that it is a smallish project. I have socks and a scarf waiting, along with sweaters for myself to complete. One lacks sleeves and a collar, and the other 3 are either not started or barely started. The almost finished sweater is a bulky knit, and at least one other is worsted weight. The good thing about those is that they go quickly. At least if you work on them.